These are the seven tallest religious buildings in the world right now – and when the epic Sagrada Familia in Barcelona is finally completed (estimated year 2026) it will be the second tallest religious building in the world. It will stand at 170 meters (558 feet) tall – but 2026 is a long way off and a lot can happen between now and then! Cue Dubai and China to compete for the number one spot! The Notre-Dame Cathedral was completed in 1345 (after 182 years under construction) and is one of the most renowned religious structures in the world. The French Gothic Roman Catholic cathedral sits in the heart of Paris in the city’s fourth arrondissement. The cathedral’s spire reaches a height of 90 meters (295 ft). It is also the home of some of the most important Catholic relics: the True Cross, one of the Holy Nails and the Crown of Thorns. Located in Changzou City in China’s southern Jiangsu province is the Tianning Temple, which is the largest wooden structure in the world, standing at 153.79 meters. The thirteen storey building was completed in 2007 and it serves as a Buddhist pagoda. With the Chinese Communist Party relaxing its control over religion, the pagoda was allowed to stand for the historically peaceful religion of Chinese Chan Buddhism. Cologne Cathedral is a Roman Catholic cathedral that serves as the location of the seat of the Archbishop of Cologne. To this date, it is Germany’s most visited landmark, with around 20,000 visitors each day. The cathedral is the largest Gothic Cathedral in Northern Europe, with its towers standing 157 meters (515 feet) high. The construction originally started in 1248 as a place of worship for the Holy Roman Emperor, but it was not completed until over 400 years later in 1880. Located in Yamoussoukro, the Basilica of Our Lady of Peace is the administrative capital building of the Ivory Coast. It is a minor Roman Catholic basilica that was completed in 1989. The church has been dubbed the largest church in the world, covering a total area of 30,000 sq. m. Additionally, the dome is approximately 158 meters (518 feet) tall, making it one of the tallest religious structures in the world. Ulm Minster, sometimes referred to as the Ulm Cathedral, is a Lutheran Church in Ulm, Germany. This magnificent Gothic masterpiece is located on the banks of the River Danube in Germany’s Baden-Württemberg region. Work on the Ulm Minster started in 1377, but it was finally completed in 1890. It is considered the tallest church in the world at 161.5 meters (530 feet) and was once the tallest building in the world. From the top level of the structure, visitors are able to view a panorama of Ulm and a glimpse of the Alps. Located in Turin, Italy, the Mole Antonelliana is 167.5 meters (550 feet) tall, and was originally constructed to serve as a Jewish synagogue. Currently, it is the home to the National Museum of Cinema, and is known as the tallest museum in the world. Its name is derived from both the architect that conceived the structure, Alessandro Antonelli and the word ‘mole’ signifies a building of huge proportions. 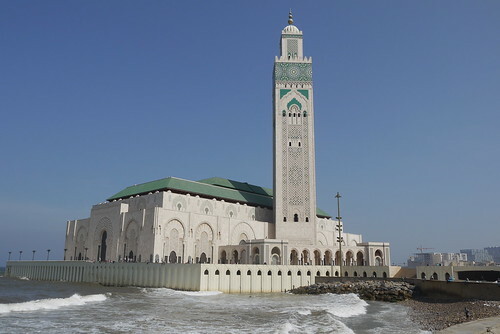 The Hassan II Mosque, also called the Grande Mosquée Hassan II, is the world’s tallest religious structure. It can be found in Casablanca, Morocco, where hundreds of thousands of Muslims worshippers congregate. The impressively ornate minaret is 60 storeys high and measures 210 meters (689 feet). The building’s hall includes a spectacular glass floor that allows visitors to view the sea bed of the Atlantic Ocean.